What is the number one cause of wildlife rehablilitator burnout? I mean, besides the killer hours, unending work, low or non-existent pay, heartache, and the fact that we’re almost always covered with something gross? Luckily, the pendulum swings. We get a series of people who are so callous and downright stupid that we fear we will end up standing in front of a judge, fending off homicide charges. But then we get a few heroes who do everything right, who go far out of their way to help an injured wild creature, and who restore … well, maybe not our complete faith in humanity, but at least our confidence that we won’t end up in jail for the rest of our lives. Here is an example of the former type. Dimmy, whose name has been changed to protect the guilty, was driving down the Saw Mill Parkway, north of New York City, when she hit a large bird. 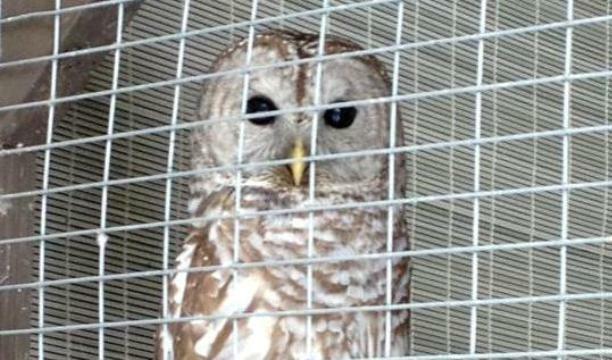 She stopped the car, got out, looked at the front of her Hyundai SUV, and found a live Barred Owl stuck in the grill. She was afraid of it. So: did she call the police? Did she call a friend? Did she drive slowly to the next exit, and find a public place where she might get some help? No. She left the stunned but struggling owl where it was, got back on the highway, and drove 40 minutes home. I kid you not. It gets better. Dimmy arrived home, checked the grill, and there was the owl, alive but certainly worse for wear. She was, as she later reported, still afraid of it. So: friend? Neighbor? Anyone? No. She went inside, had dinner, probably hit the moonshine, wormwood, meth, Drano, or whatever it is people ingest that eventually obliviates every single one of their brain cells, and then she went to sleep. Leaving the injured owl in her car’s grill. The next morning she woke up, looked out the window, and there was the owl, still struggling feebly to free itself. This time a tiny, flickering light bulb appeared over her otherwise functionless head, and she actually called the police. 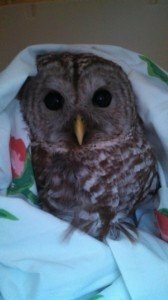 A sentient human being arrived on her doorstep, freed the owl, and carried it away in a box. He called Lisa Acton, of Animal Kingdom USA Wildlife Rescue, who took over. The owl was stressed, dehydrated, had a concussion and massive bruising, but nothing was broken. After fluids, pain medicine, and eventually some good food, he started feeling better. Not even a week later, his attitude has returned with a vengeance. He’s young and resilient, but it’s still hard to believe that he could recover from this kind of trauma so quickly. The stress of the public sometimes is hard to bear. We got in a red tail hawk that the people think they hit in CANADA and drove all the way down here to go shopping at the outlets. They told the person at the help desk that there was a hawk in their grill…AND WENT SHOPPING!!! Poor bird was in the grill most likely for well over a 2 hour drive. Our display red tail was in the grill of a semi from eastern, Pa to here in western, Pa.
Another great story, Suzie! Keep up the good work – crazy times are coming soon. It’s truly horrible that some people are that insensitive/uninformed/unaware otherwise incapable of behaving in a sensible manner. It shows an overall lack of respect for life. And each of these individuals, makes it more important for the rest of us to do a little more. So happy the owl will survive and, hopefully, flourish in the wild. We had a good-bird-person story on the NYSbirds listserv this week, in which a New Yorker saved an injured woodcock stranded in the middle of Park Avenue in midtown Manhattan. The good-bird-person brought the woodcock home in a box, posted the story on Facebook, whereupon a birder friend called NYC Audubon, who sent the good-bird-person to the Wild Bird Fund. The woodcock was seriously injured, but will be o.k. So, there are good people around, as you say. A woodcock in the middle of Park Ave? Yikes. Thanks for the good-person story, Donna, we needed one! It is sad that someone would let a bird suffer that way out of fear and stupidity. Not everyone is like Dimmy though. There was a story in the local paper last month about a woman who had a Red-tailed Hawk hit her car then realized that it was stuck behind the grill. She stopped and called the police. It took the combined efforts of a tow-truck driver who partially removed the grill and a local wildlife rehabber but they got the hawk out uninjured and off it flew. Another good story, Katrina – these are the kinds of people who keep us going! There is a person I’m acquainted with who freaks out when she sees a 2″ gecko scurrying on her apartment wall. And many women (lifetime observation) go absolutely ballistic when they are in the vicinity of an insect, be it a bee or a beetle. It’s no wonder that this woman was in a state of mental paralysis when she found an owl impaled on the grill of her car. It’s surprising she was able to get back into the vehicle and drive home. I know I’ll get beat up for this statement but, as I always say, women will never achieve full equality until they overcome the bug factor. Let the spears and arrows fly. TLM – I agree with you about the bug factor! Although it goes both ways – I know an awful lot of guys who cannot deal with spiders. Other bugs ok, but I’m always the one who has to pick the spiders up and take them outside. As for this woman, she didn’t even have to go near the owl, all she had to do was make a phone call. Or drive somewhere close and scream from the safety of her car. Personally, I think she’s too stupid to be driving a car in the first place, and definitely not a shining example of the female gender. Suzie – Thanks for taking my tongue-in-cheek comments in stride. I recently lived in Okinawa, Japan where golden-orb (aka banana or wood) spiders were plentiful. These critters (about the size of your hand) were quite striking when observed at arms length. But arachnophobia treatment would definitely be in order if I woke up with one in bed!